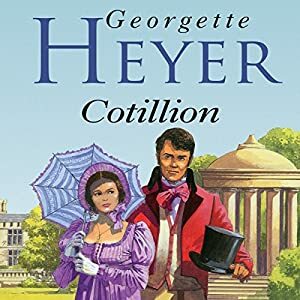 This is my first book by Georgette Heyer. I've heard so many great things about her that I wanted to see for myself. At first, I wasn't too pleased with the book, but I warmed to it once time had passed, and Kitty matured in London. You see, I didn't like Kitty at first. She seemed so manipulative - getting Freddy to propose when he clearly didn't want to. And it seemed her plan could end up destructive to both of them - even if we didn't know what the whole plan was about. I realized as she grew that the plan was just naivete and not pure manipulation, but I still found all the dangerous lies a bit disturbing. Regardless, everything turned out well in the end, and I was left with a warm fuzzy feeling about the novel. Heyer's writing is delightful. She mixes humor with the beloved Regency Romance genre, and she's often suggested to readers who have finished all the Jane Austen novels. They definitely have the same feel as an Austen, though the humor has a slightly different tone. Austen has more sarcasm in her books. Both writers have a mixture of wit and silliness. I will hopefully have time to read another Heyer soon. Just think, a brand new author to explore! I do love Georgette Heyer. She is just fun and witty. They are not books to be taken seriously but they are well written and well researched. After all, she basically started the whole Regency Romance genre. Hers are some of the books I pull out when I am having a bad day and just need a comfort read. I hope you enjoy exploring the rest of her books. I love both Heyer and Austin, but they seem very different to me. Austin's characters seem real -- they are facing real things. Heyer's people live in a frothy wonderland; I never worry that things could turn out poorly for anyone. I've always wanted to read a Georgette Heyer book, but have never gotten around to it. They just sound fun. Maybe I'll add one to my reading list this year.